Today we show you one of many impressive destinations for a nice hike in the Ecuadorian Andes. 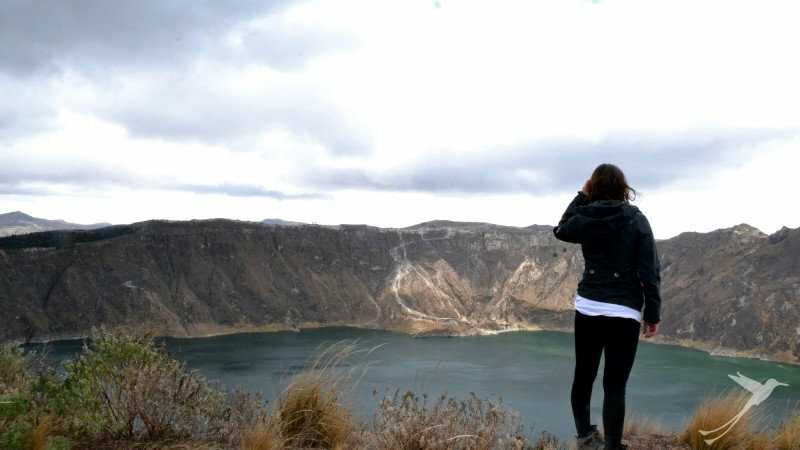 If you are looking for a perfect day trip from Quito, we recommend going to Quilotoa, where you can hike the Quilotoa loop or just hike around the crater lake. From the lookout on the crater rim you have an amazing view over the lake and, if weather permits, also of the peaks of Cotopaxi and Iliniza Sur far away in the distance. It is possible to head down a steep trail to the lakeshore where you have the chance to head out in a canoe or kayak. Or – if you are looking for a longer adventure – you can hike the Quilotoa Loop, which takes around 3-4 days. Or hike around the crater lake which takes about 5 hours. It is a 6 mile (10 km) hike up and down and along sandy paths with 12.893 ft. (3,930 m) being the highest point you will pass, but it is definitely worth it. You get rewarded not only with amazing views of the lake but also of the surrounding landscape. If you are lucky and the sun comes out, the color of the water immediately changes and you get the impression you look at a completely different lake from one moment to the next. If you are asking locals how deep the lake is, they will say it has no bottom, while geologists state that it is about 820 ft. (250 m) deep. Before doing the Quilotoa Loop you can go into town and drink a Coca Tea, to avoid altitude sickness. You can also buy Tigua paintings in this small town. Tigua is an Ecuadorian style of painting which originated in the community of the same name, not far from Quilotoa. Indigenous people paint colorful scenes from Kichwa legend on canvases including the beautiful Andean scenery. So, get off your couch, put on your boots and start exploring all the beauty Ecuador has to offer!